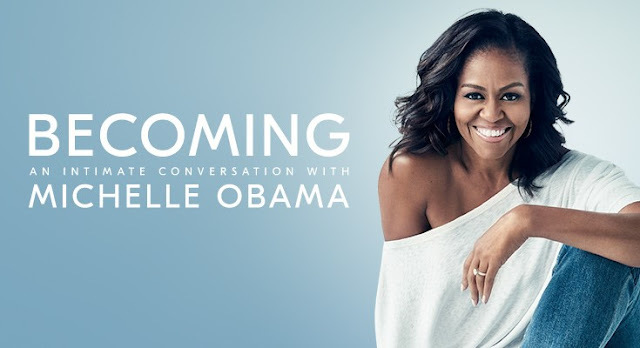 Michelle Obama will embark on a 10-city book tour that will launch in Chicago on November 13, 2018, "Becoming: An Intimate Conversation with Michelle Obama"
Live Nation and the Crown Publishing Group, a division of Penguin Random House, announced the fall 2018 dates for Michelle Obama's live U.S. book tour events in support of her highly anticipated memoir, BECOMING. Produced by Live Nation, the 10-city U.S. tour will kick off in Mrs. Obama's home town of Chicago on Tuesday, November 13, and will feature intimate and honest conversations between Mrs. Obama and a selection of to-be-announced moderators, reflective of the extraordinary stories shared in the wide-ranging chapters of her deeply personal book. Simultaneous to this announcement, Mrs. Obama released a video over her social media channels, watch at Facebook. Attendees will hear firsthand Mrs. Obama's intimate reflections on the experiences and events, both public and private, that have shaped her, from her childhood on the South Side of Chicago to her years as an executive balancing the demands of motherhood and work, to her years spent at the most famous address in the world. Michelle Obama has emerged as one of the most iconic and compelling women of our era. As First Lady of the United States of America – the first African-American to serve in that role – she helped create the most welcoming and inclusive White House in history, while also establishing herself as a powerful advocate for women and girls in the U.S. and around the world. Michelle Obama and Live Nation will also be donating 10 percent of every show's tickets to various organizations including, but not limited to, local charities, schools, and community groups in each city the tour visits. Those fans will receive free admission to the tour stop in their city. Tickets will go on sale to the general public starting Friday, September 21 at 10 a.m. local time at BecomingMichelleObama.com. To ensure tickets get in to the hands of fans and not scalpers or bots, the tour will utilize Ticketmaster's Verified Fan® platform. Fans can register now through Tuesday, September 18 at 10 p.m. PT HERE for free access to the Ticketmaster Verified Fan® presale, which will allow registered fans to purchase tickets before the general public on Thursday, September 20 from 10 a.m. local time to 10 p.m. local time. A limited number of VIP meet and greet packages with former First Lady Michelle Obama will be available at Ticketmaster.com. "I've spent the last year and a half reflecting on my story as deeply and honestly as I could, and now I'm thrilled to travel the country and do the same with readers this fall," said Michelle Obama about her upcoming tour. "I hope that this tour will inspire others to reflect upon and share their own stories—all the joys and sorrows, all the scars and renewals—so that together, we can better recognize that each of us, in our own way, is in a constant process of becoming." "We are honored to be part of these special events with former First Lady Michelle Obama," said Tara Traub, Senior Vice President of Live Nation Touring. "Hearing her share her story in person will be a memorable life experience for attendees of the Becoming tour and one that will help encourage people to find their own voice and pursue their dreams for a better future—for themselves, their families, and their communities." The Crown Publishing Group is a division of Penguin Random House, the world's largest trade book publisher, which is dedicated to its mission of nourishing a universal passion for reading by connecting authors and their writing with readers everywhere. The company, which employs 10,000 people globally, was formed on July 1, 2013, by Bertelsmann and Pearson, who own 75 percent and 25 percent, respectively. With more than 250 independent imprints and brands on five continents, Penguin Random House comprises adult and children's fiction and nonfiction print and digital English- and Spanish-language trade book publishing businesses in more than 20 countries worldwide. With 15,000 new titles, and 600 million print, audio and ebooks sold annually, Penguin Random House's publishing lists include more than 60 Nobel Prize laureates and hundreds of the world's most widely read authors.